The progressive digitization of our lives penetrates work, education and leisure worlds and therefore changes the way we work, learn and entertain ourselves. 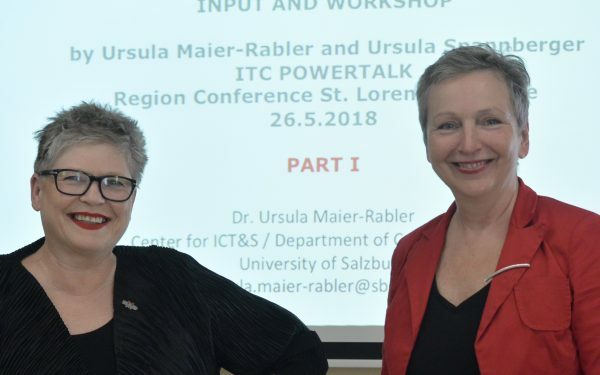 Communication Scientist Ursula Maier-Rabler gave the basics of how digital technologies enter our lives and the implications on society. She showed how the internet developed by combining three formerly separated services: computers, broadcasting and telephony. First computers were connected and formed networks, then people connected through social networks and after that things and locations were included by using sensors. Now we are entering the era of algorithms, which combines technical with biological and behavioral data. People no longer have to be in the same room in order to work together. Information travels in an instant. In order not to be driven by the tempo of the development und the new technical possibilities everybody has to decide for themselves which parts of digitization serve us well and which we do not need or even do not want to have in our personal lives. All of this is changing our society and the way people interact with each other. To enable this change, we need spaces and buildings, that allow new forms of connection but also of retreat. Architect Ursula Spannberger gave an insight into her way she develops flexible new spaces to work and to live in, including the actual people that will be using the space, helping them to communicate their needs and wishes. She showed examples of how different workplaces or schools look like, when these new ways of working and learning flexibly come into consideration when planning a building. Ursula Maier-Rabler explained how the most active knots in a network, those who share the most information, are the most successful. Ursula Spannberger expended on how this is also true for physical space. Flexibility in active use and the possibility to switch between activity and relaxation will be key in digital and spatial worlds. Conference attendees then discussed their own experiences and the implications digitization will have on their work and private life and consequently on the spaces they are inhabiting and using.